Click here to stream Brevity. Boxes within a larger box and inside the largest is everything: a home and its quiet order. As in a dream, two families separated by time share a single space. Unaware of each other’s existence, they reside simultaneously within the dark chambers that hold them, their daily lives, and the inevitable conflict and melodrama that ensue. Though independent to a degree, patterns emerge: the minutiae of a messy kitchen; the desperate attempts at solitude, at togetherness; a simple afternoon of shadow puppets, of candlelight, of flashlight beams, of choice. 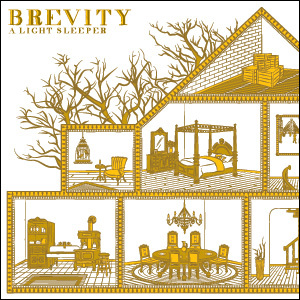 Recorded over Halloween weekend in 2010 as a transitional four-piece and hidden away until now, Brevity serves as a snapshot of A Light Sleeper’s ever-evolving dynamism. Building upon their former sound in a striking fashion, these are miniature puzzles in which the pieces never cease moving yet somehow fall into their beautiful, proper place. As always, this release comes to you in a lovingly handcrafted and limited edition package. Constructing a mythology around the songs themselves, it also features an accompanying booklet featuring text written by Another New Calligraphy’s Robyn Detterline and Bill Ripley. Drawing upon phrases from the lyrics as inspiration, this supplementary tale weaves a narrative based upon the quiet damage of the everyday. ANC014 is a special collaborative affair, and just the start of things to come. ANC014 is out of print.